Press Release: Mission critical service providers must measure and deliver on the uptime promise. DocMagic does. TORRANCE, Calif.—April 1, 2014—DocMagic, Inc., the leading provider of fully-compliant loan document preparation, compliance and eDelivery solutions for the mortgage industry, announced today that more of its customers are expressing concern with the reliability of their mission critical technology systems and asking for more information about system uptime from their vendors. 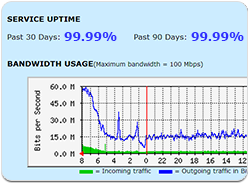 DocMagic has maintained these stats for its own company for many years and publishes its status, including uptime, processing time and bandwidth, in real time, on its website at: https://www.docmagic.com/webservices/status/main.jsp.